Trtl Travel Pillow Review 2019: Does It Live Up To The Hype? Home » Pillows » Trtl Travel Pillow Review 2019: Does This Unique Travel Pillow Live Up To The Hype? Have you tried all the horseshoe-shaped travel pillows out there to no avail? The Trtl Travel Pillow turns typical travel pillow design on its head by offering a new and innovative shape that supports your head and neck in the upright sleeping position. Is it the travel pillow for you? Keep reading to find out! The Trtl Pillow receives fantastic reviews for the support it provides to your neck and head while sleeping seated, and is made from a quality soft fabric that is comfortable and easy to clean. The Trtl Travel Pillow is an innovative travel pillow designed to provide unparalleled neck support when you’re sleeping in a seated position. Constructed from a soft fleece fabric with hidden internal support, this unique design holds your head in a more ergonomic position while you rest – promising to provide convenient comfort when you’re on the go. Created by Coolside Limited in Great Britain, the Trtl Pillow was designed to provide a more comfortable sleeping experience when travelling, with a more ergonomic and compact design than a traditional U-shaped travel pillow. We’ve taken a look at the construction and key features of the Trtl Pillow below, so you can decide for yourself whether this unique design is going to keep you comfortable and well-rested when you’re on the move. Lightweight & Compact: The Trtl Pillow weighs just under half a pound and is easily compacted to fit in your carry-on bag or on the outside of your rucksack. For travellers looking to avoid the bulk of a traditional U-shaped travel pillow, this is a good alternative. Machine washable: To keep your Trtl Pillow clean and fresh, you simply need to remove the internal neck support before placing it in the wash. Neck support: One of the key features of the Trtl Pillow is the hidden neck support which promises to hold your head in a far more ergonomic position – ideal for even the most uncomfortable of journeys. Soft fleece fabric: Constructed from a soft fleece fabric, the Trtl Pillow provides a cosy surface to rest your head and keep your entire neck warm on those colder flights. 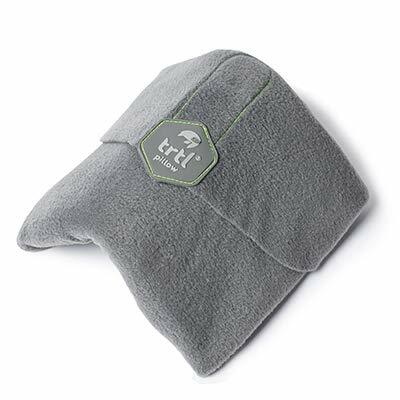 The Trtl Pillow is constructed from a soft polyester fleece wrap, with a plastic internal support system that is designed to fit between the face and shoulders to keep your neck supported when sleeping. This plastic structure is combined with a layer of polyurethane foam for added cushioning and can be rotated to support your head from the front, back, or side. The Trtl Pillow is designed to provide a more supportive way to sleep when you’re travelling and is suitable for use on a plane, bus, train, or anywhere else you’re seated and in need of a small and compact travel pillow. As the key feature of the Trtl Pillow is its supportive internal frame, this pillow is best used only when you’re seated, as it provides support for the neck and holds your head in place, a feature that would not be comfortable or necessary when sleeping flat. The Trtl Pillow retails for $29.99, which is slightly higher than the average cost for a travel pillow online. However, the Trtl Pillow does offer some unique features that aren’t included in many more traditional, U-shaped pillows, so this may be an investment worth considering if a comfortable sleep when travelling is a top concern for you. Trtl offers a 60-day money back guarantee with their products, so you can try it for yourself before committing to it. If you find that the Trtl Pillow isn’t for you in those first 60-days, you can send it back for a full refund – no questions asked. The Trtl Pillow measures just 7.5×7.5×3.7 inches and receives many glowing reviews for its compact design, allowing you to easily pack the pillow into your hand luggage or attach it to the outside of your bag without the bulkiness that comes with most U-shaped travel pillows. What’s more, the fleece fabric of the pillow is highly-rated for providing an extremely soft, warm, and comfortable sleep surface, and it is also hypoallergenic, providing the perfect travel pillow for allergy sufferers. The biggest downside of the Trtl Pillow appears to be that it is not completely compatible for use when wearing headphones, although many user reviews do state that they still manage to make this work. The Trtl Pillow makes some big claims on what sets it apart from a traditional pillow, but for the most part, those claims appear to be true. The Trtl Pillow receives fantastic reviews for the support it provides to your neck and head while sleeping seated, and is made from a quality soft fabric that is comfortable and easy to clean. While the cost of this travel pillow is a little above average compared to competitors, it does seem to be worth the investment if getting a comfortable sleep is a key priority to you when travelling.